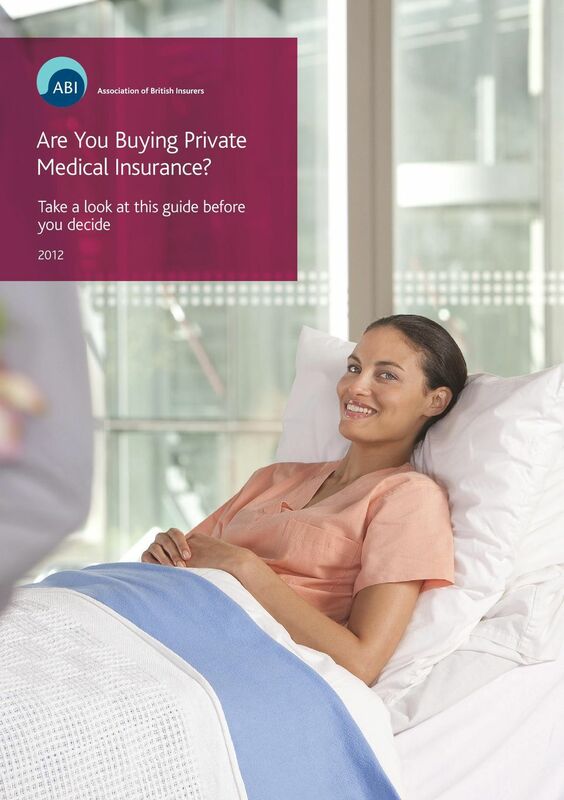 Download "Are You Buying Private Medical Insurance? 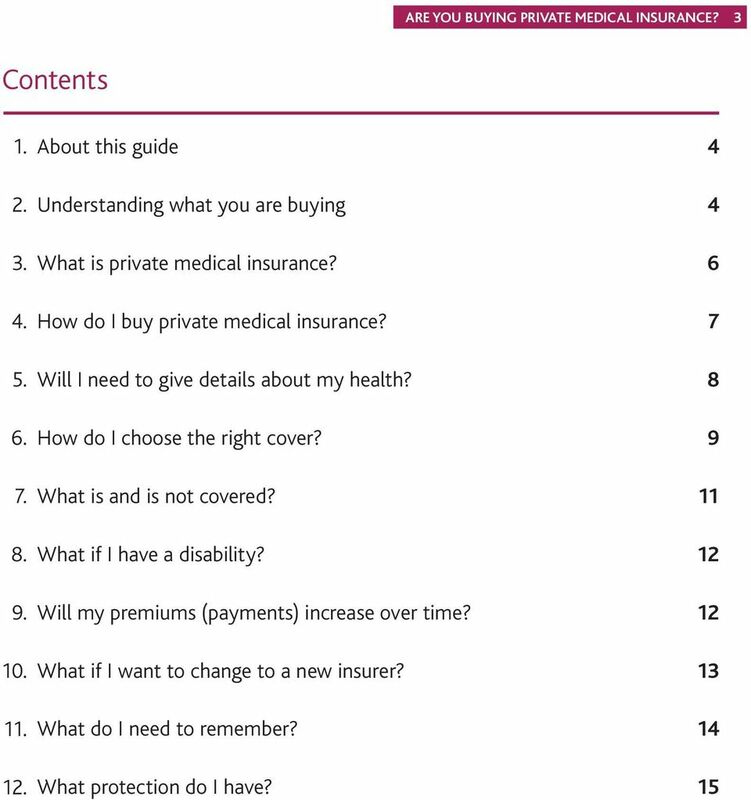 Take a look at this guide before you decide"
4 4 ARE YOU BUYING PRIVATE MEDICAL INSURANCE? 1. 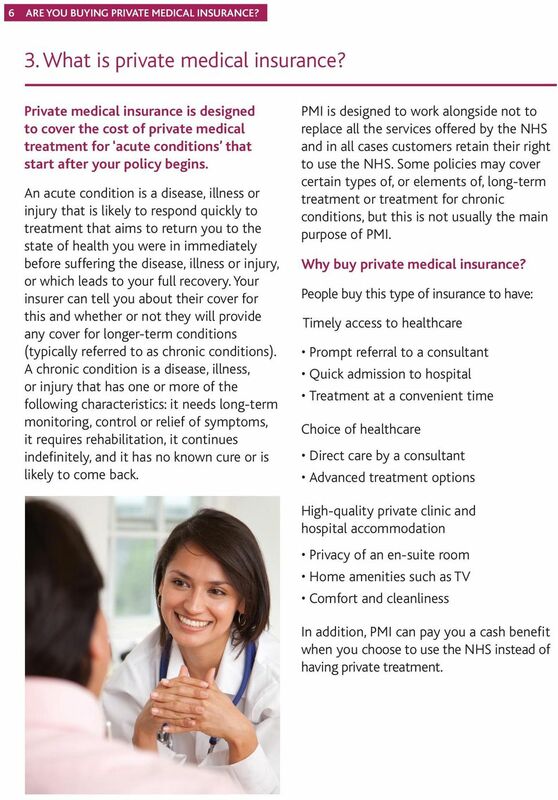 About this guide This guide is for individuals who are thinking about buying private medical insurance (PMI). 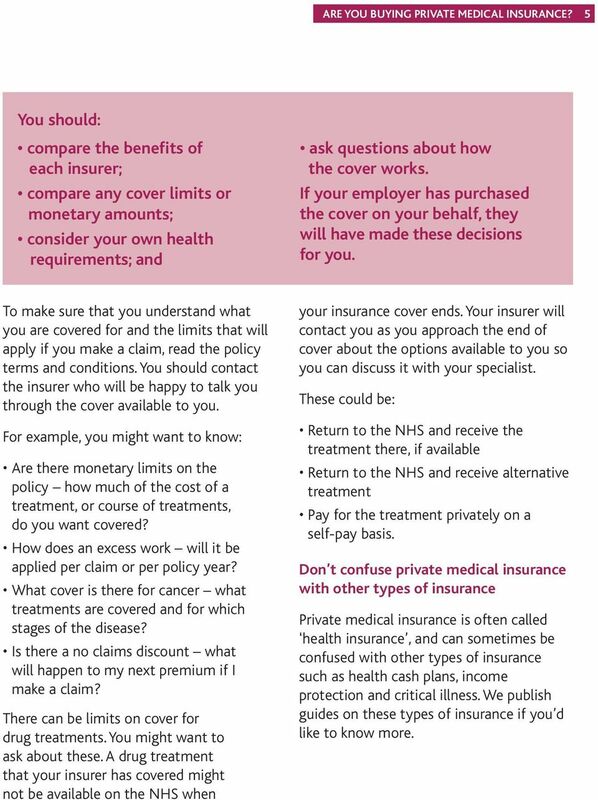 If you get PMI as a benefit through your employer, your employer will have all the information about your insurance cover which may be different from the general information detailed in this guide for individuals purchasing PMI, for example the cooling-off period will not apply if your employer has purchased the insurance for you. 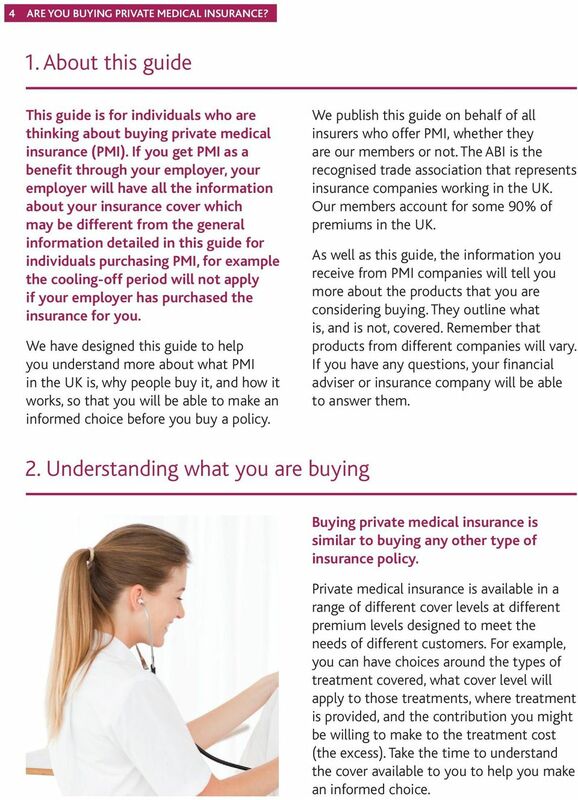 We have designed this guide to help you understand more about what PMI in the UK is, why people buy it, and how it works, so that you will be able to make an informed choice before you buy a policy. 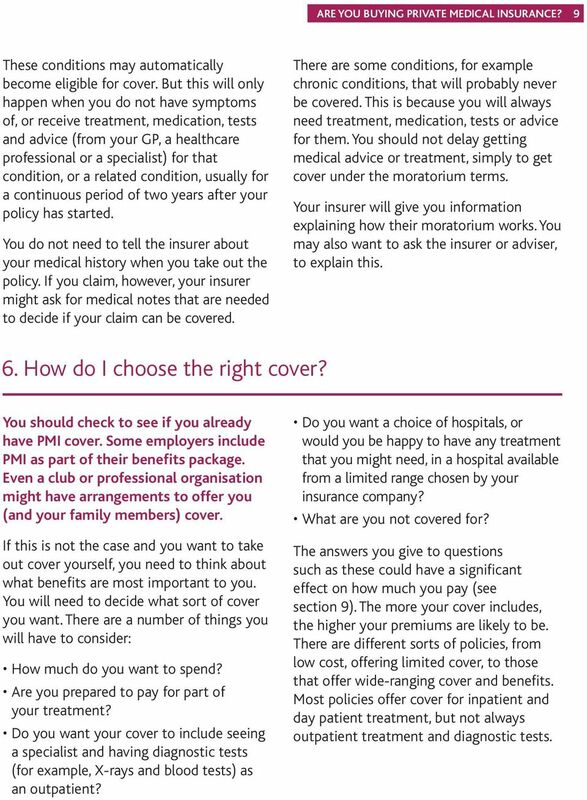 We publish this guide on behalf of all insurers who offer PMI, whether they are our members or not. The ABI is the recognised trade association that represents insurance companies working in the UK. Our members account for some 90% of premiums in the UK. As well as this guide, the information you receive from PMI companies will tell you more about the products that you are considering buying. They outline what is, and is not, covered. Remember that products from different companies will vary. If you have any questions, your financial adviser or insurance company will be able to answer them. 2. Understanding what you are buying Buying private medical insurance is similar to buying any other type of insurance policy. Private medical insurance is available in a range of different cover levels at different premium levels designed to meet the needs of different customers. For example, you can have choices around the types of treatment covered, what cover level will apply to those treatments, where treatment is provided, and the contribution you might be willing to make to the treatment cost (the excess). Take the time to understand the cover available to you to help you make an informed choice. 5 ARE YOU BUYING PRIVATE MEDICAL INSURANCE? 5 You should: compare the benefits of each insurer; compare any cover limits or monetary amounts; consider your own health requirements; and ask questions about how the cover works. If your employer has purchased the cover on your behalf, they will have made these decisions for you. To make sure that you understand what you are covered for and the limits that will apply if you make a claim, read the policy terms and conditions. You should contact the insurer who will be happy to talk you through the cover available to you. For example, you might want to know: Are there monetary limits on the policy how much of the cost of a treatment, or course of treatments, do you want covered? How does an excess work will it be applied per claim or per policy year? What cover is there for cancer what treatments are covered and for which stages of the disease? Is there a no claims discount what will happen to my next premium if I make a claim? There can be limits on cover for drug treatments. You might want to ask about these. A drug treatment that your insurer has covered might not be available on the NHS when your insurance cover ends. Your insurer will contact you as you approach the end of cover about the options available to you so you can discuss it with your specialist. These could be: Return to the NHS and receive the treatment there, if available Return to the NHS and receive alternative treatment Pay for the treatment privately on a self-pay basis. Don t confuse private medical insurance with other types of insurance Private medical insurance is often called health insurance, and can sometimes be confused with other types of insurance such as health cash plans, income protection and critical illness. We publish guides on these types of insurance if you d like to know more. 6 6 ARE YOU BUYING PRIVATE MEDICAL INSURANCE? 3. What is private medical insurance? Private medical insurance is designed to cover the cost of private medical treatment for acute conditions that start after your policy begins. An acute condition is a disease, illness or injury that is likely to respond quickly to treatment that aims to return you to the state of health you were in immediately before suffering the disease, illness or injury, or which leads to your full recovery. Your insurer can tell you about their cover for this and whether or not they will provide any cover for longer-term conditions (typically referred to as chronic conditions). A chronic condition is a disease, illness, or injury that has one or more of the following characteristics: it needs long-term monitoring, control or relief of symptoms, it requires rehabilitation, it continues indefinitely, and it has no known cure or is likely to come back. PMI is designed to work alongside not to replace all the services offered by the NHS and in all cases customers retain their right to use the NHS. Some policies may cover certain types of, or elements of, long-term treatment or treatment for chronic conditions, but this is not usually the main purpose of PMI. Why buy private medical insurance? People buy this type of insurance to have: Timely access to healthcare Prompt referral to a consultant Quick admission to hospital Treatment at a convenient time Choice of healthcare Direct care by a consultant Advanced treatment options High-quality private clinic and hospital accommodation Privacy of an en-suite room Home amenities such as TV Comfort and cleanliness In addition, PMI can pay you a cash benefit when you choose to use the NHS instead of having private treatment. 7 ARE YOU BUYING PRIVATE MEDICAL INSURANCE? 7 How does private medical insurance work? Although policies can be different, medical treatment usually has to start with a referral by your GP for specialist treatment. Before you arrange any private treatment, you should call your insurance company to check that you are covered for the treatment. Stay in touch with your insurer at each stage of your treatment. Your insurer will confirm if you are covered. 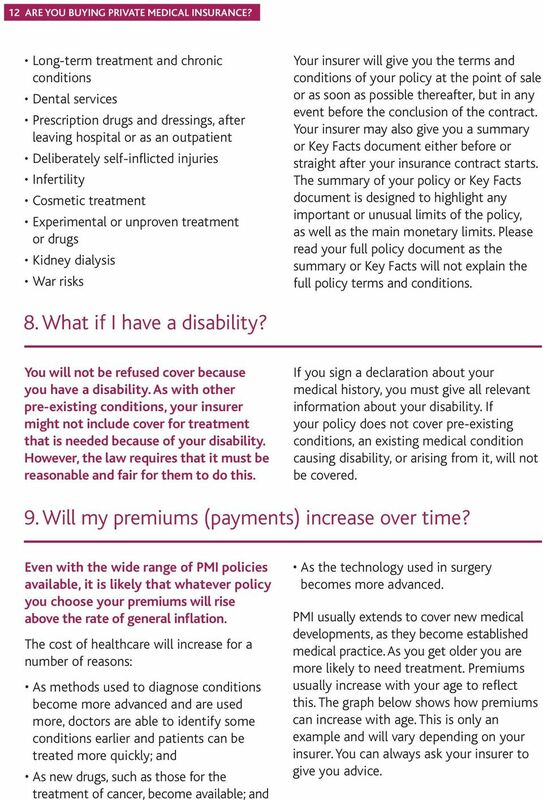 It is likely that treatments for some illnesses, including pre-existing conditions (conditions from which you are already suffering, or have already had before your policy started) will not be covered by a private medical insurance policy (see section 5 of this guide). 4. How do I buy private medical insurance? 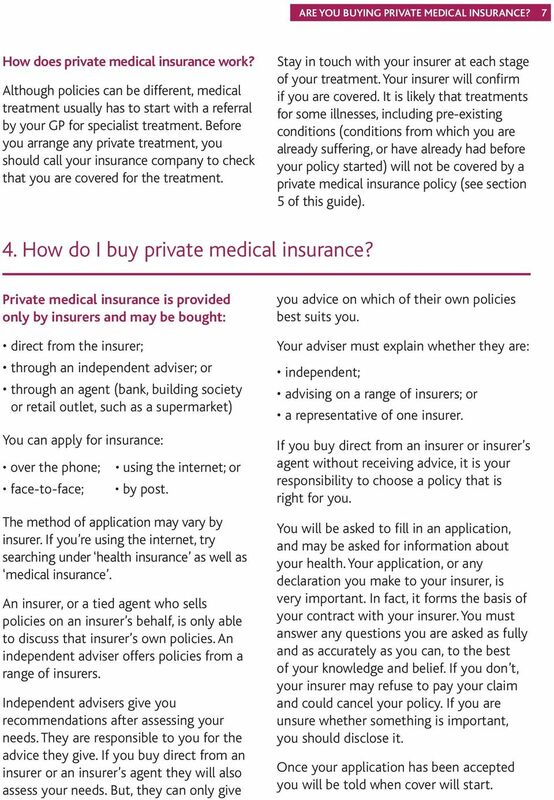 Private medical insurance is provided only by insurers and may be bought: direct from the insurer; through an independent adviser; or through an agent (bank, building society or retail outlet, such as a supermarket) You can apply for insurance: over the phone; face-to-face; using the internet; or by post. The method of application may vary by insurer. If you re using the internet, try searching under health insurance as well as medical insurance. An insurer, or a tied agent who sells policies on an insurer s behalf, is only able to discuss that insurer s own policies. An independent adviser offers policies from a range of insurers. Independent advisers give you recommendations after assessing your needs. They are responsible to you for the advice they give. If you buy direct from an insurer or an insurer s agent they will also assess your needs. But, they can only give you advice on which of their own policies best suits you. Your adviser must explain whether they are: independent; advising on a range of insurers; or a representative of one insurer. If you buy direct from an insurer or insurer s agent without receiving advice, it is your responsibility to choose a policy that is right for you. You will be asked to fill in an application, and may be asked for information about your health. Your application, or any declaration you make to your insurer, is very important. In fact, it forms the basis of your contract with your insurer. You must answer any questions you are asked as fully and as accurately as you can, to the best of your knowledge and belief. If you don t, your insurer may refuse to pay your claim and could cancel your policy. If you are unsure whether something is important, you should disclose it. Once your application has been accepted you will be told when cover will start. 8 8 ARE YOU BUYING PRIVATE MEDICAL INSURANCE? Cancellation period Your insurer will send you policy documents when your policy has been set up. You have at least 14 days from the day you receive them to decide whether the product is suitable for you. This is commonly known as a cooling-off period. If you want to cancel your policy, you must do so within the stated period and tell the insurer that you want to cancel your cover. If you have made any payments you will usually receive a full refund unless you have made a claim. 5. Will I need to give details about my health? You won t normally be covered for any illnesses you are currently suffering from, or have already had. These are known as pre-existing conditions. You must answer all questions as fully and as accurately as you can, to the best of your knowledge and belief. There are two main methods that PMI companies use to deal with your application for cover. These are: full medical underwriting; or moratorium underwriting. All PMI companies will offer you the full medical underwriting option. Only some companies offer the moratorium option. Full medical underwriting (medical history declaration) You are asked to give details of your medical history. The insurer may write to your doctor for more information, but they do not do so in every case. You must give all the information you are asked for. If you don t, your insurer may refuse to pay any claim that you make in the future, or may cancel your policy. If you are not sure whether to mention something, it is best to do so. If you have a medical condition that is likely to come back, the insurer will issue a policy, but that condition (and any related to it) might not be covered. This condition may never be covered, or not covered for a set period of time. Moratorium underwriting You are not asked to give details of your medical history. Instead, the insurer does not cover treatment for any medical condition that you have received treatment for, taken medication for, asked advice on or had symptoms of. In other words, you will not be covered for any condition that existed in the past few years. Five years is the usual time period. 9 ARE YOU BUYING PRIVATE MEDICAL INSURANCE? 9 These conditions may automatically become eligible for cover. But this will only happen when you do not have symptoms of, or receive treatment, medication, tests and advice (from your GP, a healthcare professional or a specialist) for that condition, or a related condition, usually for a continuous period of two years after your policy has started. 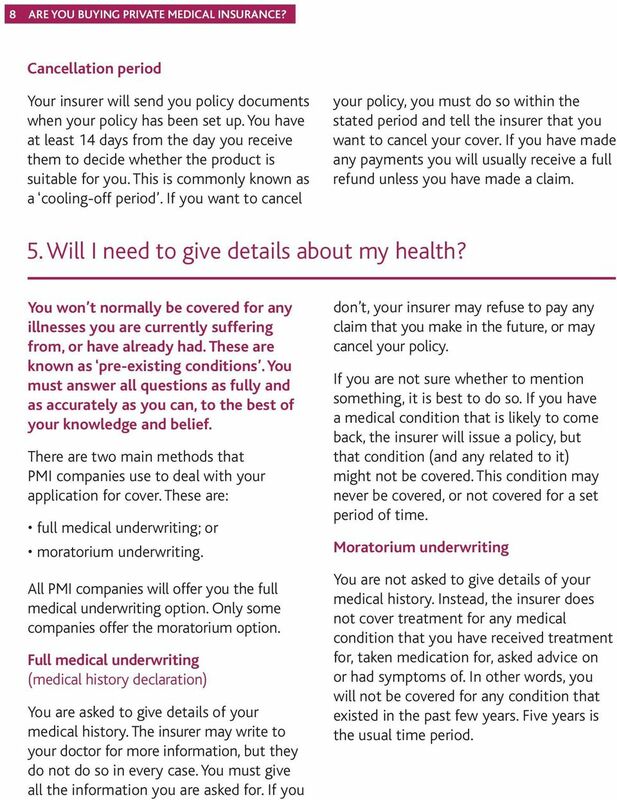 You do not need to tell the insurer about your medical history when you take out the policy. If you claim, however, your insurer might ask for medical notes that are needed to decide if your claim can be covered. There are some conditions, for example chronic conditions, that will probably never be covered. This is because you will always need treatment, medication, tests or advice for them. You should not delay getting medical advice or treatment, simply to get cover under the moratorium terms. Your insurer will give you information explaining how their moratorium works. You may also want to ask the insurer or adviser, to explain this. 6. How do I choose the right cover? You should check to see if you already have PMI cover. Some employers include PMI as part of their benefits package. 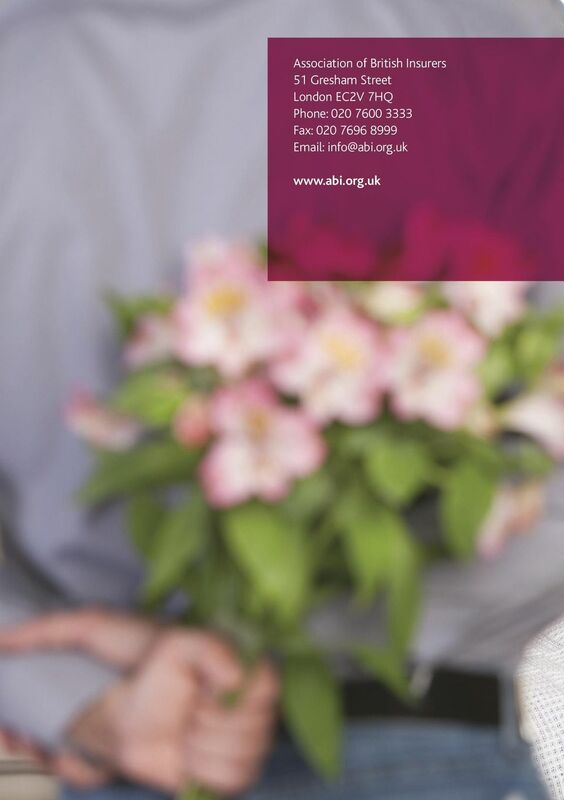 Even a club or professional organisation might have arrangements to offer you (and your family members) cover. If this is not the case and you want to take out cover yourself, you need to think about what benefits are most important to you. You will need to decide what sort of cover you want. There are a number of things you will have to consider: How much do you want to spend? Are you prepared to pay for part of your treatment? Do you want your cover to include seeing a specialist and having diagnostic tests (for example, X-rays and blood tests) as an outpatient? Do you want a choice of hospitals, or would you be happy to have any treatment that you might need, in a hospital available from a limited range chosen by your insurance company? What are you not covered for? The answers you give to questions such as these could have a significant effect on how much you pay (see section 9). The more your cover includes, the higher your premiums are likely to be. There are different sorts of policies, from low cost, offering limited cover, to those that offer wide-ranging cover and benefits. Most policies offer cover for inpatient and day patient treatment, but not always outpatient treatment and diagnostic tests. 10 10 ARE YOU BUYING PRIVATE MEDICAL INSURANCE? The following diagram is an example of how you might get private treatment. Visit your GP Your GP needs to refer you for investigations or treatment. GP refers you for specialist treatment This usually includes initial consultations and diagnostic tests. 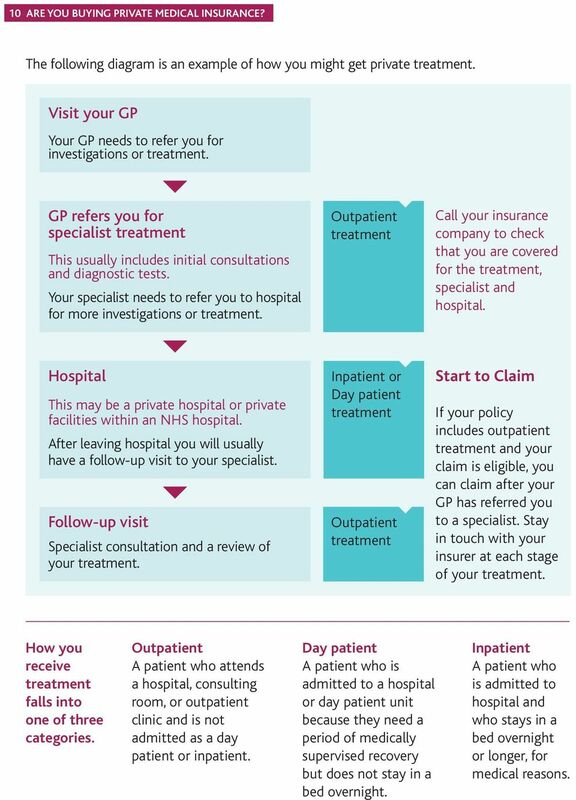 Your specialist needs to refer you to hospital for more investigations or treatment. Outpatient treatment Call your insurance company to check that you are covered for the treatment, specialist and hospital. Hospital This may be a private hospital or private facilities within an NHS hospital. After leaving hospital you will usually have a follow-up visit to your specialist. Follow-up visit Specialist consultation and a review of your treatment. Inpatient or Day patient treatment Outpatient treatment Start to Claim If your policy includes outpatient treatment and your claim is eligible, you can claim after your GP has referred you to a specialist. Stay in touch with your insurer at each stage of your treatment. How you receive treatment falls into one of three categories. Outpatient A patient who attends a hospital, consulting room, or outpatient clinic and is not admitted as a day patient or inpatient. Day patient A patient who is admitted to a hospital or day patient unit because they need a period of medically supervised recovery but does not stay in a bed overnight. Inpatient A patient who is admitted to hospital and who stays in a bed overnight or longer, for medical reasons. 12 12 ARE YOU BUYING PRIVATE MEDICAL INSURANCE? Long-term treatment and chronic conditions Dental services Prescription drugs and dressings, after leaving hospital or as an outpatient Deliberately self-inflicted injuries Infertility Cosmetic treatment Experimental or unproven treatment or drugs Kidney dialysis War risks Your insurer will give you the terms and conditions of your policy at the point of sale or as soon as possible thereafter, but in any event before the conclusion of the contract. Your insurer may also give you a summary or Key Facts document either before or straight after your insurance contract starts. The summary of your policy or Key Facts document is designed to highlight any important or unusual limits of the policy, as well as the main monetary limits. Please read your full policy document as the summary or Key Facts will not explain the full policy terms and conditions. 8. What if I have a disability? You will not be refused cover because you have a disability. As with other pre-existing conditions, your insurer might not include cover for treatment that is needed because of your disability. However, the law requires that it must be reasonable and fair for them to do this. If you sign a declaration about your medical history, you must give all relevant information about your disability. If your policy does not cover pre-existing conditions, an existing medical condition causing disability, or arising from it, will not be covered. 9. Will my premiums (payments) increase over time? Even with the wide range of PMI policies available, it is likely that whatever policy you choose your premiums will rise above the rate of general inflation. The cost of healthcare will increase for a number of reasons: As methods used to diagnose conditions become more advanced and are used more, doctors are able to identify some conditions earlier and patients can be treated more quickly; and As new drugs, such as those for the treatment of cancer, become available; and As the technology used in surgery becomes more advanced. PMI usually extends to cover new medical developments, as they become established medical practice. As you get older you are more likely to need treatment. Premiums usually increase with your age to reflect this. The graph below shows how premiums can increase with age. This is only an example and will vary depending on your insurer. You can always ask your insurer to give you advice. 13 ARE YOU BUYING PRIVATE MEDICAL INSURANCE? 13 Indexed price Comparative price by age The indexed price is how much the price increases when compared to the price at age 35. So, the indexed price at age 35 is 100. When you are aged 70 it is around three times the price for someone aged Age Can I reduce my premiums? 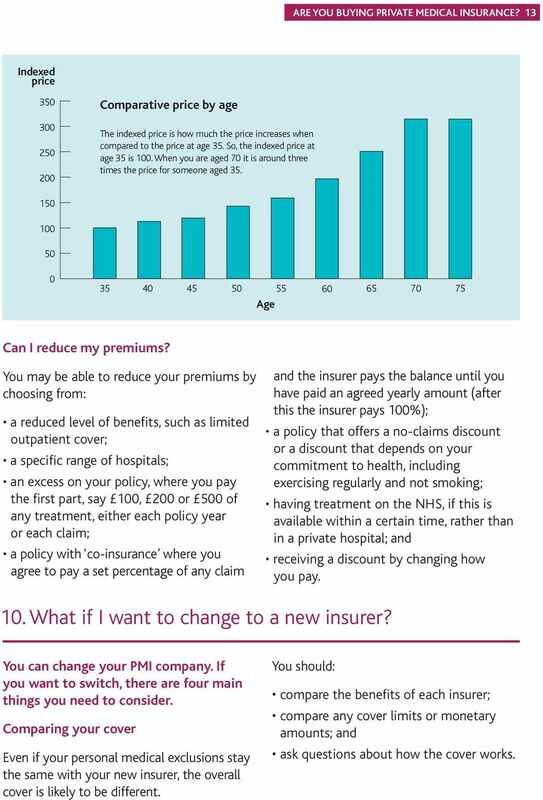 You may be able to reduce your premiums by choosing from: a reduced level of benefits, such as limited outpatient cover; a specific range of hospitals; an excess on your policy, where you pay the first part, say 100, 200 or 500 of any treatment, either each policy year or each claim; a policy with co-insurance where you agree to pay a set percentage of any claim and the insurer pays the balance until you have paid an agreed yearly amount (after this the insurer pays 100%); a policy that offers a no-claims discount or a discount that depends on your commitment to health, including exercising regularly and not smoking; having treatment on the NHS, if this is available within a certain time, rather than in a private hospital; and receiving a discount by changing how you pay. 10. What if I want to change to a new insurer? You can change your PMI company. If you want to switch, there are four main things you need to consider. Comparing your cover Even if your personal medical exclusions stay the same with your new insurer, the overall cover is likely to be different. You should: compare the benefits of each insurer; compare any cover limits or monetary amounts; and ask questions about how the cover works. 14 14 ARE YOU BUYING PRIVATE MEDICAL INSURANCE? Paperwork Paperwork varies from one company to another, but there s likely to be an application form to sign and you might need to provide a copy of the policy certificate from your current insurer as proof of your current cover. When you choose to switch Usually, private medical insurance is offered through an annual contract. 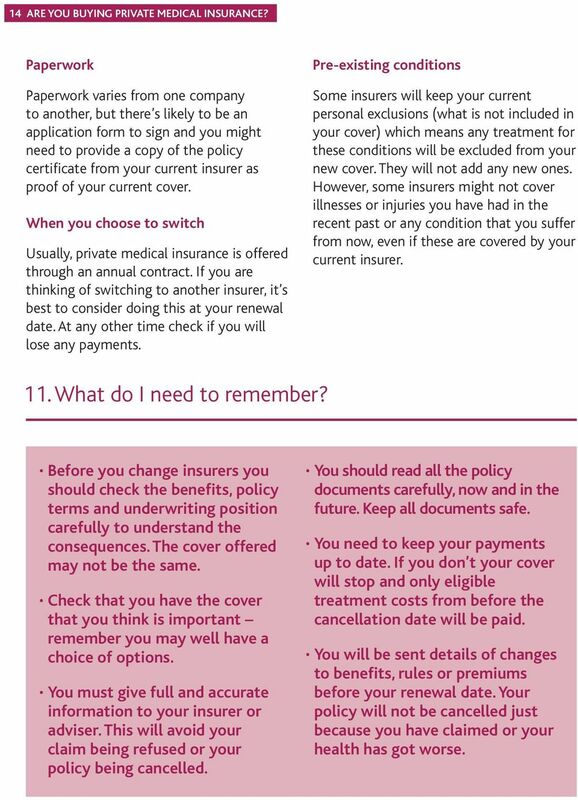 If you are thinking of switching to another insurer, it s best to consider doing this at your renewal date. At any other time check if you will lose any payments. 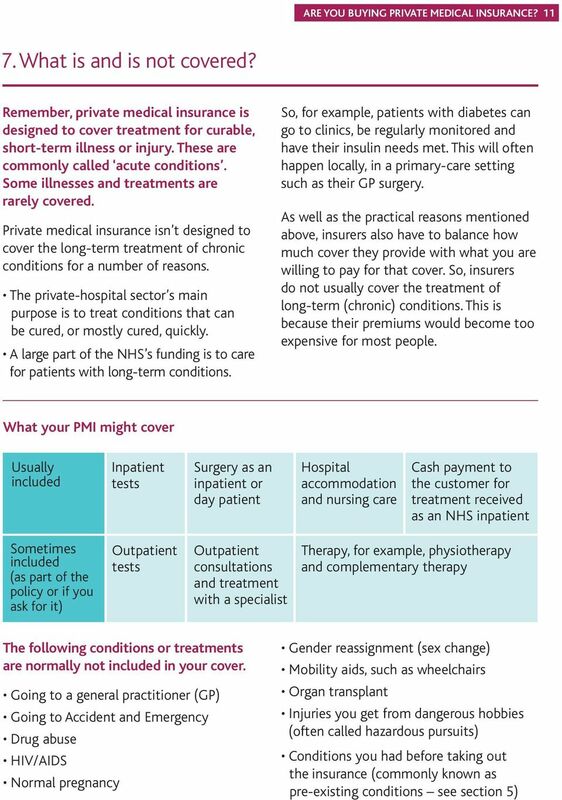 Pre-existing conditions Some insurers will keep your current personal exclusions (what is not included in your cover) which means any treatment for these conditions will be excluded from your new cover. They will not add any new ones. However, some insurers might not cover illnesses or injuries you have had in the recent past or any condition that you suffer from now, even if these are covered by your current insurer. 11. What do I need to remember? Before you change insurers you should check the benefits, policy terms and underwriting position carefully to understand the consequences. The cover offered may not be the same. Check that you have the cover that you think is important remember you may well have a choice of options. You must give full and accurate information to your insurer or adviser. This will avoid your claim being refused or your policy being cancelled. You should read all the policy documents carefully, now and in the future. Keep all documents safe. You need to keep your payments up to date. If you don t your cover will stop and only eligible treatment costs from before the cancellation date will be paid. You will be sent details of changes to benefits, rules or premiums before your renewal date. Your policy will not be cancelled just because you have claimed or your health has got worse. AN ABI GUIDE TO LONG-TERM CARE INSURANCE Things you should know about Long-Term Care Insurance If you are thinking about buying long-term care insurance, there are a number of things you need to understand. April 2015 Gold Hospital Cover (as at April 2015) Contracted Hospitals When a hospital agreement is in place the RBHS will rebate the agreed amount to the hospital from the date the agreement commences. This document contains important information about the Lifestyle Plus Protection plan and you should read it along with your quote. Policy Summary. If you have a deferred payment scheme, no benefit will be paid for any disability which happens during the deferred period. 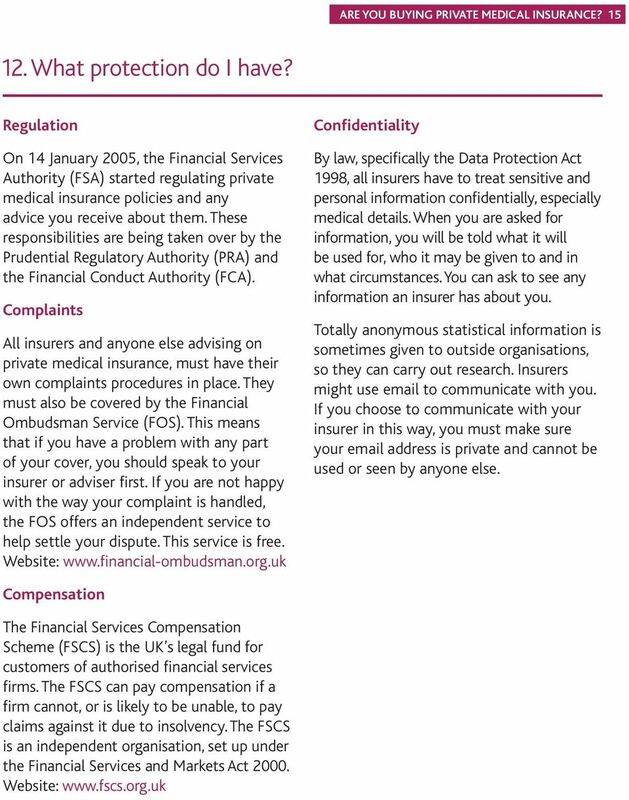 Policy Summary The information below is only a summary of your insurance and does not contain the full policy terms and conditions. Please see the Policy Document for full details of the cover provided. General & Medical. Private Health Insurance. for individuals and families. in association with Newmarket Lifestyle www.newmarketlifestyle.co. Accident, Sickness & Hospitalisation Plan. Paying you an income if you can t work. Ireland. Changing the image of insurance.